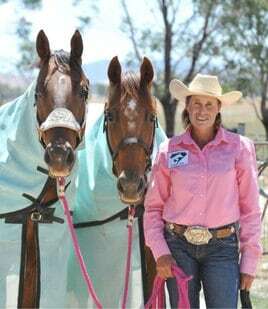 Adele Edwards is arguably the Queen of the sport of barrel racing in Australia. 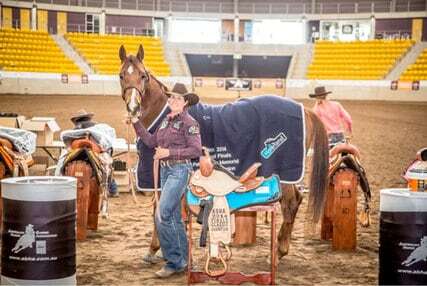 She has won everything there is to win across Australia nominating the ABHA Classic in Tamworth in 2014, Mt Isa and Warwick Rodeos and the Australia Open at Equitana in 2013, as some of the most notable. With husband Darrell and son Dylan they are based at Nangus near Gundagai in NSW where they breed and train their 3D Quarter Horses, established with the stallion Roc N Morn who had Thoroughbred blood and cutting lines. For over 15 years Adele has utilised natural feeding and herbal remedies from Equine Herbalist, Victoria Ferguson, to promote strength, health and soundness in their breeding, growing and competition horses. “I am always asked what I feed my horses because they always look wonderful. I must admit I have strayed a bit over the years, but I always come back to the VF Natural Diet because it produces great muscle with balanced energy and is cost effective. I will continue to feed my horses along these lines. “The feeds are all individualised and made up from scratch, which is more time consuming, but it pays dividends. 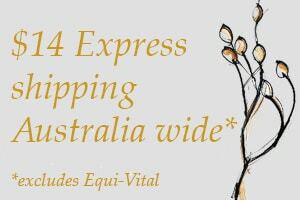 “Victoria’s book The Complete Horse Herbal is also a great resource and I go to it all the time, but I also talk to her on the phone when I have problems that need herbal treatment to sort out & she makes up individual remedies and sends them down to me. “The first horse Victoria treated for me had a spur on a hock so we opted for the herbal treatment instead of an operation and it was a complete success, he went back into competition and was sound for many years after that. The other one that comes to mind is a horse we spent a fortune on with vets for no result with lymphangitis which she was able to fix quite quickly. 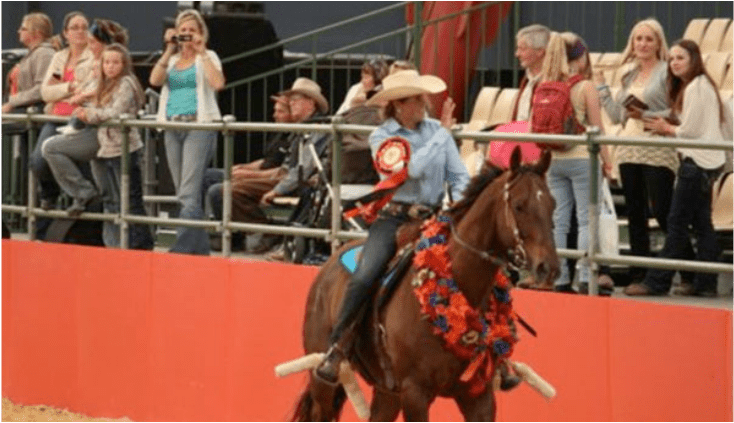 Adele is President of the Australian Barrel Horse Association which is growing rapidly with over 1,000 members. She and Darrel help to promote the sport with Adele frequently giving clinics to aspiring riders and Darrel often officiating as a Judge. Adele was born into a horsey family and she grew up riding horses, went through pony club and competed with hacks and showjumpers at Ag shows and Royals all over the country. After leaving school she played polocrosse, rode track work, held an amateur jockey’s licence, then become involved with rodeos and barrel racing. For years she worked on a stud which bred sprint racing quarter horses, western pleasure and cutting horses. Adele selects for athleticism, size and heart in the horses she breeds, they are 15 to 16 hh, and this is the legacy of the throughbred and cutting lines in their founding stallions, Roc n Morn and Traditional Roc. “I enjoy the whole process of starting the unbroken young ones and training them through to being competitive barrel horses. 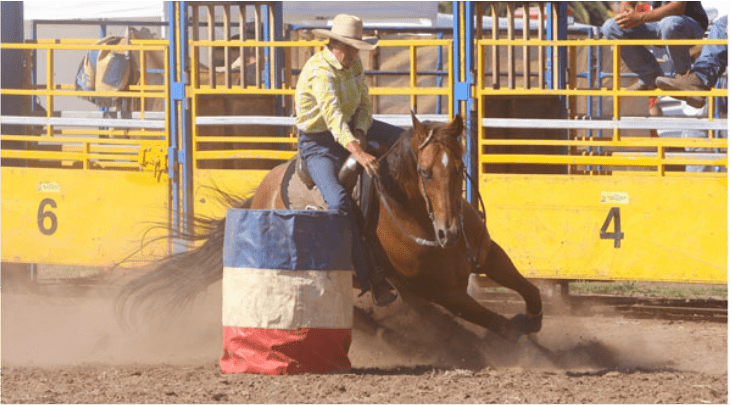 “Anybody can run a horse around three drums but there’s a lot of training involved if you wish to barrel race at a high level. The horse needs to be an athlete, be able to reach speed quickly, slow down and collect to turn. Then be fast and fluent through the turn and gather itself quickly to reach speed again and run to the next barrel. “The best ones have a big ticker and they love their job. On any day I’d choose a horse which might not be the best but tries hard over one that has ability but won’t try. Adele focuses on good horsemanship in her training and instructing. “This is a really physical sport and there are numerous things I do to give my horses the best chance of staying sound. Not putting undue pressure on young, immature bones is one thing I never do. I’ll not ask a horse to run fast around a barrel until it is at least 4 or 5 years old. This is why we never run our horses in futurities before they are 5 years old. “Ensuring they’re conditioned properly before asking for fast runs is another thing I’m always aware of – unfit horses are more likely to strain themselves, and good shoeing is also a must. Knowing when to back off a horse which may be getting a little sore is also important. “I also think the VF Natural diet contributes significantly to keeping these athletes sound, strong and healthy. Adele is looking forward to many more years competing in futurities and championships, especially with her current top horse Moon Roc, a 10 year old with a big heart who has won all over the country.